How well do you know the London Underground? Test your knowledge with this cool on-line game that was launched yesterday. Look-for-longer is a quirky montage (see below) of puns that show 75 stations. So far I've identified 49. It's getting harder. See how well you do and report back to me in a few days. I'll be incredibly impressed with anyone who can do it in one day. Anonymous, the 4 nuns is nunhead. Can't figure out the glue yet. 2 to go - The man in the street with the TV wrapped in rope, and the rat with the cheese - Any ideas?? Willing to swap answers. Haha! Love this... I got 21.... In my defense, I haven't lived there in a few years! the rat with the cheese - leicester square. Many thanks - 1 to go!!! I'm sure it will be obvious when I see it - but, don't think I'd have got the rat/cheese. Got it - All done!!! I'm sure I'd fail miserably but what a fantastic idea! So creative and of course now I'm going to go click on it and try my luck. which one is the guy with the telly... driving me crazy !!!!!!! What fun! But I really shouldnt waste any more time... but what the hell! Only up to 19 in 20 mins. Will spend more time later. Guy with telly is all i'm missing.... Please help! My head hurts! Watch out 'cause there are actually 76. I've done 72 and am left with 1) the fish 2)the bloke with the rope/draw 3) the 3 chip fryers 4) the hay stack rolling down the hill! what colour are the friers ? But what is the rabbit poking out of the hillside... not warren street apparently... last one ! The rabbit in the hole is Borough. I need the lady with up hair and the drum. Anyone can help? Bounds Green picture was just too vague. 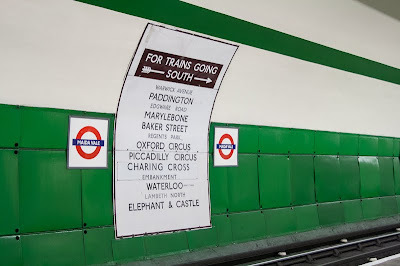 Luckily Bounds Green is in the Bs of the Tube station list! I can't get the cityscape at the back or the dog, which I think is golders green but it won't accept that? Just one to go - the thing on the left that looks like a fountain with a broken pot. Please help - been trying all day. And I live in Yorkshire! the pot is a toiler and the fountain has water. I need the green dog! Think the dog is hither green. Cake in the road is Victoria! Actually, not the fish, the wizard turning people green! Can't work it out! The dog is bounders green. No it's not. The dog is Parson's Green. My son and I got them all. The hardest was the glue, think what glue does to two items, and the Dog. Went through all the greens and I'd love to know how the first part is signified. The TV too was a problem but saying what the rope is doing and to what gives it. Please help me with the white flag !!!!!!! What country's flag is it? I'm stuck on the wizard on the hill, the airplane, the big white dome with something on top and the white structure next to the woman marrying the bone...any ideas?? What is the ham and football??!! I have put Fulham and it says that I am nearly there. What am I missing??!! What is the ham right next to the football (not the ham next to Barbie and Ken, I know that is West Ham). I have put Fulham and it tells me that I am almost there. I don't know what I'm missing and I have also tried Fulham Broadway. Balham. What is te airplane? I must be stupid, 'cos no-one else has mentioned these. Footballer in red ? Lips ? Fire in the middle of the road ? Person watering the tree ? Man firing into the sky ? And, like others, the wizard. What a shame I can't enter, 'cos I don't subscribe to either Facebook or Twitter - any other way ? Plank above the bridge - Wood Green. Did I miss it - what's the wizard ? Wizard is turnham green. Only 1 left the flag. Please help its driving me crazy!!! The flag is Cyprus - footballer in red anybody ? Help! What is the man watering that small plant? Sheep in bath is Lambeth North and construction above bride is Archway. man firing iun sky is Mudchute. What is the Q shaped hedge and the fountain? Heavy load up in the air? Thanx! Q shaped hedge is kew gardens. Fountain is Waterloo and heavy load in air is wood green. Yahay..........just one more to get, now. Please tell me what those lips are all about (if they are indeed lips) ? anyone help with the torn tree???? no its not that one, the one below it where there appers to be a corner turned up. Oh....you've just helped me. I thought they were lips, but it's a beak........hence....Becontree. Heavy load in the air is Brixton. two to go: the guns on the hill and the white cross. any help please? what about the 'pressed' on the road? Does anyone know what the woman carrying the beer is please - thats my last one? Just two left to go! The stone with late written on it and the metal hammer and block thing at the front...?? What a young ballerina's sitting on bridge? only three more to go.. I'm on my last one and I really need some help! I bet its obvious but I really cant figure out what the skyline at the back is! What is the crushed drinks can please? got 74/75 but cant find last one cant find one to click onto please help. I have Bond Street but cant't figure out the one next to it, I've answered 75 so perhaps it's a mistake. It's the one underneath the Bow Tie.. It's driving me nuts! Help please! The red herring IS "Red Herring" just type it in. What is the Bride with top hat? That is a "Fin" that has been "buried". A "Killed" man that is "Burnt"
I'm stuck on the nuns on the right and the man behind the chess pieces. thanks for not giving the clue exactly - allows for a bit more thought. The nuns - I thought it was All Saints at first, but try thinking of where nuns live and they are hiding behing a hedge! What is the well please? yes, she is marring a bone.. Anyone know what the drum is????? 73. Nearly There. Am i the only one thta cannot get the kings crossing the road? the red fish? and the shepard and the bush? 75 all done & one ignored - superb idea, great fun and hugely addictive. Loved it! which makes 4 more but i only have 70 is there a tiny small one somewhere im missing? idk what the sign is either. Thanks, Manor House is saying its close but not right???? got barking and bank, so now just need the house (as above) and the westminster sign...Anyone? what is the thing on the hill above royal oak? Got to 74/75 and theres nowhere left to click!!! I've done them all but cant submit. That "thing" I think it's monument you're talking about. Try hovering over the page..
Kings cross keeps saying nearly....Shepherds bush too. Why?? can anybody tell me the exact spellings that go in pleassseee. Ive got 74 out of 75! can't find anymore...someone before said there is a stone with late on it and the answer is Leytonstone, but I can't find it! Where is it near? Shepherds Bush, spelt like that. What do you mean by Kings cross? The chess pieces? Or the shiny cross because that's New Cross. the chess pieces thanks. ive tried that exact spelling but it keeps saying “nearly there’ its sooooo frustrating. They are the last two left. Just type them in, Bobs yer uncle. Yeah, sounds like you've hit a snag. Maybe close the page and log back in again? I also had 74 out of 75, and even had the red herring, but couldn't even find the last one, just wouldnt pop up, then i found it!! Bottom left hand corner, there is an "Oval" on the pub wall, Hurrah!!! Nice One CBS! try king's cross and shepherd's bush :) good luck! building on the hill is tower hill. Does anyone know what the drum is, its my last one! Am I just being stupid, I have all the others, what is the cross on top of the Shard? Cross on top of shard? It's my last one!! Anyone know what the bridge in the background is? Last one... What is the tree with a crown on top?? Can't figure it out!!! Whats the black horse you can see underneath 'Marble Arch' ? Oh god, just realised it's Blackhorse Road. Duh!!! What is the mill, the p sign, the building behind woman marrying the bone? pn;y one more to get - what is the man with the gun on the top of the mansion house please? whats the archway behind the bride? I was thinking Hatton cross because of the hat. But your bent cross comment got me thinking.Its Brent Cross. Thanks All 75 done!! Just the crushed tin can on the road to go...help? I wish I had been told about this forum 2 days ago as I might have been able to sleep longer. I have found 72 and need help. Only one left! What's the fire on the road? I tried Kilburn, but that comes up as Nearly. the oval on the wall: you already have the answer!! the red pin: look on the metropolitan line. It's not manor road, it's mansion road, that's why it won't work. I mean mansion house, not road. What's the firing hole on the road?? i can't guess it!! Please would someone tell me what the man watering the small tree on the right hand side is?? Help with last one please - what is the tree with the crown on it? Finally got my Hams the right way round Got my 75? Well I certainly feel like it after all that!!! ok so was on 74/75 for ages, then got the fish..... but it still says I have 74 and cannot click on anything!!! any help please?!?!? Toni- try the far left at the bottom, there's an oval on the wall that I didnt notice until I was also on 74 and couldnt click anything! the well is stockwell, i don't know how that thing is stock? eh. the man with the watering can and the tree is bayswater. i assume its a bay tree. the gate on the roof of the building is lancaster gate - there's a lancaster bomber above it. One left! The tower on the grey hill at the back?! the TOWER on the HILL...mmm?